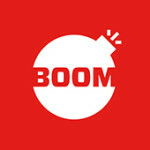 Facebook page The Presstitute resorts to photoshop to target Mirror Now anchor Faye D’Souza. Deletes post when the bluff is called out. 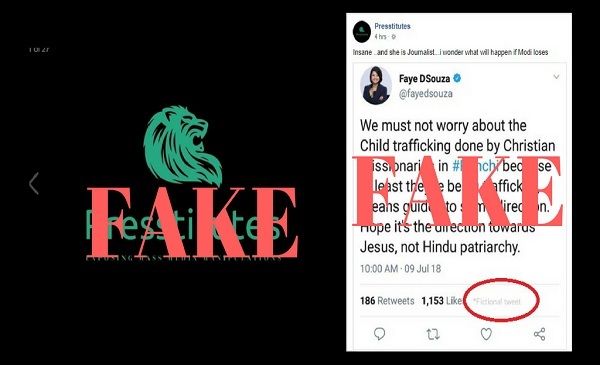 A troll page on Facebook named ‘ThePresstitute’ posted a photoshopped tweet of Mirror Now Editor Faye D’Souza on the recent alleged child trafficking case in Ranchi involving an institution run by the Missionaries of Charity, a Roman Catholic order founded by Mother Teresa. 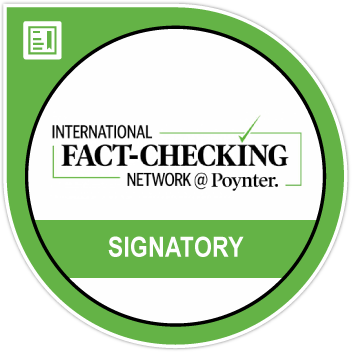 The page, which is followed by over 5,80,000 on Facebook, regularly targets journalists and individuals it sees as liberal leaning. 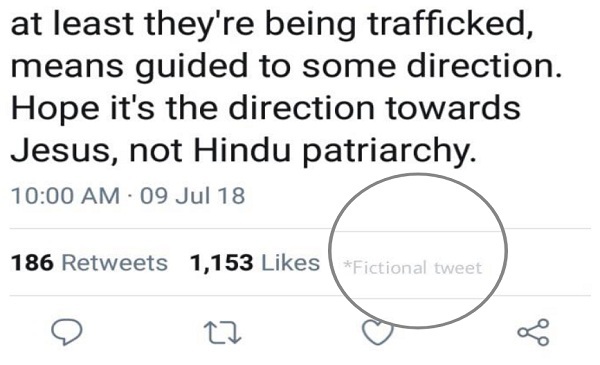 However, at the bottom of the image the words “Fictional tweet” was typed with an asterisk. The post which received about 1800 shares and over 412 comments was shared with the caption “Insane and she is a journalist. Wonder what will happen wid Modi loses.” Many in the comments section pointed out to the page admin that it was a photoshopped tweet yet the post was online several hours later. Jharkhand Police arrested Sister Konsalia Balsa, in-charge of Nirmal Hriday and Anima Induwar, an employee at the shelter home on July 5, 2018 for their alleged involvement in selling a newborn baby boy to an Uttar Pradesh-based couple. Niramal Hriday is a shelter home for pregnant unmarried women in Ranchi. Police are treating the case as one of human trafficking and are investigating whether it was more widespread. A local unit of the Child Welfare Committee (CWC) has since shifted 22 children out of Shishu Niketan, another shelter home in the vicinity, to a new accommodation. Both institutions are run by the Missionaries of Charity. A spokeswoman for the Catholic religious order told Reuters they were shocked by the incident and that it was against their moral conviction. Jharkhand Chief Minister Raghubar Das has instructed that a probe be conducted on the workings of NGOs and trusts in the state following the incident, according to news reports.